Country role: Kay Middleton, Fr Jason Middleton and Archbishop Mark Coleridge at St Joseph’s Church, Gayndah after the installation. FR Jason Middleton has swapped the beaches for the country life as he begins as the new parish priest for Gayndah parish. The 31-year-old priest was officially installed asparish priest by Archbishop Mark Coleridge on August 4 at 9am in St Joseph’s Church, Gayndah. More than 100 people attended the Mass, which according to Fr Middleton, makes for “a full church”. Fr Middleton’s mother also attended the Mass, along with parishioners of All Saints Albany Creek, where he had spent time as a seminarian, local politicians and members from the surrounding Gayndah Christian churches. Fr Middleton replaces Fr John Khoai, who moved from the country to the coast to become the parish priest for Runaway Bay. It was also Archbishop Coleridge’s first visit to the Gayndah community. “It was a joyous and spirit-filled celebration, with participation by many members of the community,” Fr Middleton said. “Much time and effort went into preparing the liturgy, music and singing for the Mass, as well as the beautiful decoration of the church and the ‘feast’ arranged in the Gayndah Arts Centre. Fr Middleton said being in the archbishop’s presence was a great moment for the parish. “He’s a fantastic preacher, and people really responded to his presence,” he said. Fr Middleton said while his new parish duties would be “very different”, there was a “great spirit” among the parishioners. “Moving from my ministry on the Gold Coast for over four years to a country parish has been both an exciting and daunting opportunity,” he said. 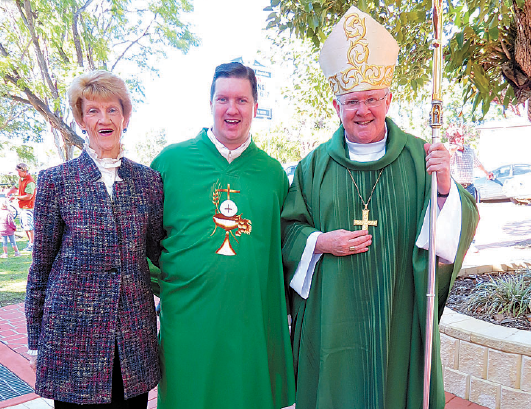 “However, even though this is a time of great learning and growth for me as a first time parish priest, I have been overwhelmed not only by the immense welcome and support of parishioners here, but also by my brother priests. “I am extremely grateful to Archbishop Mark for his confidence in me to take on this new step in my life and ministry. Over the next six years as parish priest, Fr Middleton said he would look at the sacramental program and find ways to encourage new people to become involved. “I have no real grand plans at this stage, as I’m just getting into the groove of parish life in the country,” he said. Fr Middleton said he was “truly privileged” to be part of the Catholic history of Gayndah, which is the oldest town in Queensland. The first Mass celebrated in Gayndah was in 1853, but the town did not have a parish priest until 1871. “I am truly privileged to join them as one who will serve this community in the years ahead,” he said.